Building your own means of transportation has always been a fascination for many a grease monkey ever since the internal combustion engine was first introduced to the broader public. Once people figured out how it all works, there was no stopping the onslaught of cheeky-looking, lovable if somewhat clunky vehicles which could barely pass the scrutiny of the health ‘n’ safety officials! Indeed, whether it’s concocting a contraption that saves fuel, has more wheels than the vehicles produced by companies en masse (which some regard a MAJOR plus), or engaging in an act of bush mechanics to save some money, the clever spanner-wielding folk never sleep. Now, in case you have a special knack of joining metal parts together and making them stay there and then also like motorcycles, building your very own two-wheeler can be a great way to display your full creative genius, and also personalize your new creation to your heart’s content! In this article, we’re going to explain why this might be a good idea, and also give you a rough sketch of how to go about it. Why Build a Bike Yourself in the First Place? The tough thing about buying a brand new motorcycle would be price, for many people. Sometimes the bike of your dreams can be just out of your reach financially, although, when you look at it – the sum you’d spend on all the individual parts it’s comprised of doesn’t look that bad, at all. Thus, purchasing all the necessary parts for what you need individually can save you a tonne of money! Also, you’ll have the proper grease monkey’s pleasure of building it all yourself, which is prospect money can’t buy. One of the merits of building something by yourself, of course, is that you can make it in whatever way you see fit. Whether it’s a curious-looking framework, cool stickers, custom-made exhausts or some other decoration you fancy installing on your bike, you can do it six days till Sunday. As long as the resulting creation passes the laws regarding the traffic procedures and health and safety stuff, you’re free to do whatever you so desire. Depending on what motorbike style you’re going for, you’re going to need a framework that allows you to build the remainder of the structure in without needing to modify it further. For example, if you want your bike to look like a chopper, then you’ll need to have the front bars elongated and also need to alter the shape of the head pipe joint. Now, engines come in all shapes and sizes, so in order to pick one that will work perfectly for what you need, make sure to inspect certain key elements, such as the pistons, cylinder heads, the carburetor, etc. Also, at this point, you’ll be purchasing a transmission, as well. When installing the whole thing, make sure to be careful not to damage anything, because both the frame and the engine together with transmission are quite heavy. Carefully place these two inside the frame and then add other elements once they’re sitting pretty in their spot. Building and installing the exhaust can be, but not necessarily, the easiest part of the job. The thing is, the exhaust doesn’t need to be complex. All you really need is a pipe that will lead the fumes away from the motor cylinders. For this purpose, you can get yourself just any old pipe that fits in size, bend it so that it follows the shape of your bike, and then secure the arrangement with some metal scraps and screws and bolts. If you’d like a more elaborate looking design and you don’t have the tools to make it happen, you can contact a nearby bike parts shop and order a custom made exhaust pipe. This would be another category where you unless you have the necessary machinery, can’t really do much other than just buy the parts from a store. Well, perhaps not the fenders. Those you can actually make yourself. But you’d have to be careful because if you misgauge them, you can end up with tires rubbing off against it. Of course, the sort of tires you’re going to get for your bike depends entirely on your taste, although some bike styles require quite specific tire arrangements, so to speak. Choppers, for example, usually have a wide rear tire, while the front one is thin, so make sure you don’t mess that up. One of the greatest things about making your own motorbike would be that you get to paint it whatever color you desire. The thing is, of course – you’d have to do it before assembling all the parts because once everything is up-and-running you won’t be able to reach all the parts and paint them properly. So, the painting part should come after you’ve made the entire framework into the proper shape and also shaped all the other parts such as fenders and pedals, as well. It is at this point that you need to do the paint job, then let it dry off, and then and only then can you do the full assembly. 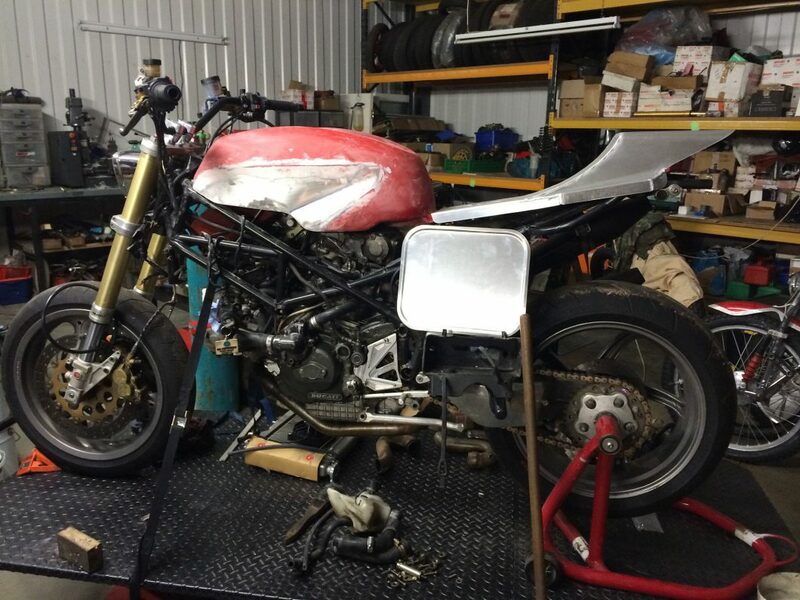 All things considered, creating a fully functional motorbike is not as difficult as it seems, but is still a task that needs to be approached with respect and patience. If you know what you’re doing and are willing to learn more along the way, chances are – building your own motorbike will be a great experience that may even turn into a full-blown hobby!